SINGAPORE - While commuters are generally satisfied with the quality of cabs in Singapore, many feel that waiting times and information on taxi services, such as fare details, are still lacking. The third instalment of the Land Transport Authority's (LTA's) annual Taxi Customer Satisfaction Survey, released on Monday (March 14), found that 97.3 per cent of respondents were satisfied with taxi services in 2015. Though this is a slight dip of 0.8 percentage points from 98.1 per cent in 2014, it is higher than 2013's 95.6 per cent, said LTA. 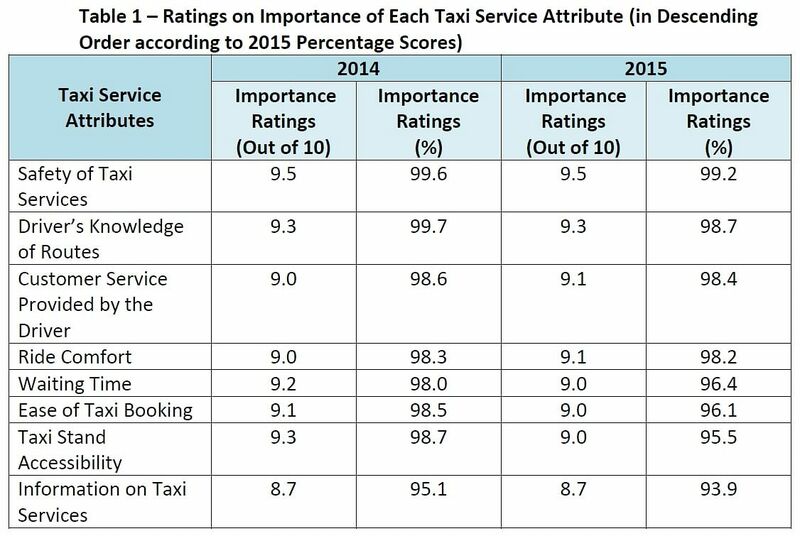 Out of the eight service attributes respondents were asked to rate, those of waiting times and information on taxi services were found to have the widest gap between expectations and satisfaction. On a scale of one to 10, with one being "very dissatisfied" and 10 being "very satisfied", commuters rated waiting times a 7.2, and information on taxi services a 7.4. Comparatively, other service attributes performed better - the safety of taxi services was rated 8.3, while ride comfort and taxi stand accessibility each earned an 8.1. This was followed by driver's knowledge of routes (8.0), ease of taxi booking (7.9), and customer service provided by the cabby (7.8). Some 1,200 regular taxi commuters aged 15 years and above were interviewed in August and September last year at cab stands around Singapore. While satisfaction levels took a slight dip, more commuters felt that the overall quality of taxis services improved in the latest survey, compared to previous years. About 60.3 per cent said so, compared to 52.4 per cent in 2014, and 46 per cent in 2013. Going forward, LTA said that it will review the scope of the survey to also cover customer satisfaction with third-party taxi booking apps and private hire car services in next year's survey. The authority is also finalising the review of private hire car services such as Uber and GrabCar after a series of engagements with key stakeholders. More details will be made known in the coming weeks, LTA said.